Rainfall is not the only thing in short supply on the Surf Coast. The apathy of locals to visits by overseas artist's gigs means that promoters won't take a chance and prefer more educated locales such as the shipwreck coast for music tourists. 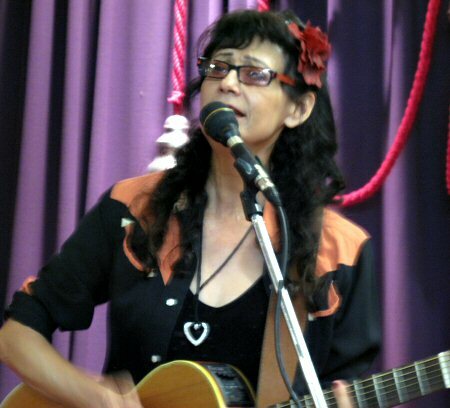 Thus when an opportunity to hear Texan Rosie Flores in the intimacy of a house concert on the home soil of the surf coast neither wild horses nor pumping waves would keep me away. 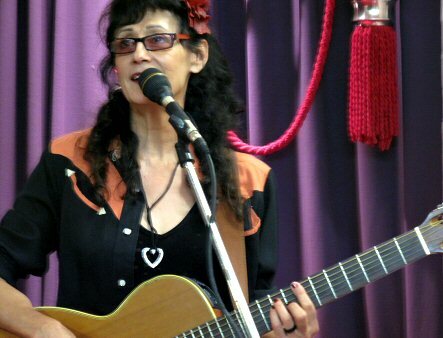 Here on a short Antipodean visit to New Zealand to write her memoirs the rock a billy filly as she is affectionately known preceded her mentor Wanda Jackson when she performed at the long lamented Continental Café in 1998 to promote the Dancehall Dreams album released by Shock records. A two night stand on the surf coast saw her perform the previous night at the appropriately decorated Piping Hot Chicken shop in nearby Ocean Groovy (maybe there are some venues and hope for the coast) before a house party in Old Torquay. Big backyards stocked with fruit, vine and shade trees are under threat from the developer's greed as they raze the earth to jam the land with units, townhouses and shops all with the acquiescence of the local shire burghers. Having never been to a house or in this case yard party before it was a great honour and a nice surprise to see such a well organised PA, mixer and set up for the artist. Opening the gig was local resident and well known performer Dave Steel. A brief but enjoyable set was put out by Dave with original songs driven along by his trademark country blues sound. After a short break and with the sun dipping in the west together with the predominant fresh on shore it was Rosie's turn to treat the assembled crowd on rugs and chairs to her act. Introduced by 3RRR's Denise Hylands from Twang as being a big enough star in Austin Texas to have a day 31 August named in her honour, Rosie kicked off with an autobiographical song, Aromatherapy (Kind of Girl). Getting the crowd on side with her winsome and candid attitude before breaking out the blues chops with the Memphis Minnie penned Chauffeur, the Radney Foster up-tempo Bring it On and then the lament of the homesick Bandera Highway about home town of San Antonio. Rosie had a story to tell about each number and recounted the time that she was star stuck being introduced to Johnny Cash at Mueller Airport in Austin before giving us the original rockabilly version of the song Get Rhythm. This was quickly followed by the wry word play of This Cat's in the Doghouse. Flores knows how to pick a good song and name check writers such as Haggard, Cowboys and Outlaws, the Jon Langford Halfway Home and rockabilly chestnut Hotdog kept the heat up as the air temperature fell prompting Rosie to bemoan her chilled fingers were causing difficulty to her finger picking dexterity. As she worked through her set it was apparent that not only does she have a great back catalogue and body of work but knows how to work a crowd and is an accomplished solo performer when not leading her own rockabilly band. Her generosity extended to inviting notable audience member Vika Bull onto stage as well as Dave Steel to accompany her on his guitar towards the end of the set. Highlight of the performance was her rendition of the Butch Hancock penned Boxcars that included her tale of woe losing her purse in London which evoked memories of Jerry Jeff's, London Homesick Blues for this writer who is looking forward to the upcoming tour by the Flatlanders. The encore featured Rosie inviting all attending kids up on stage for a sing-along and a jump start to their future musical careers but with the light fading all that could be done was to toast Rosie for breaking the drought.